Children in Years 4, 5 and 6 participated in a workshop led by STEM (Science , Technology , Engineering and Mathematics) Kent . They learned about the importance of engineers and the essential role that they have in everyday life. 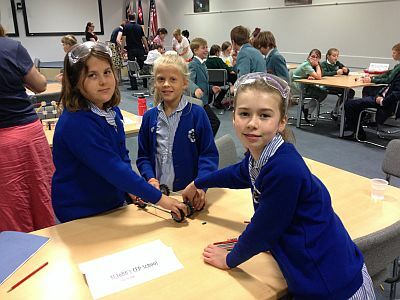 The children were put into teams of three and were set an engineering challenge. They were asked to design a vehicle that would use only wind power to transport a shoe across the hall. The children set about planning and testing their models with great determination and enthusiasm. The facilitator judged the entries on their design, distance travelled and the team work shown. 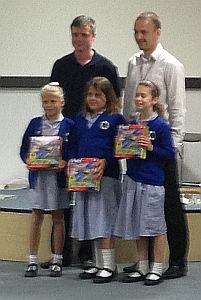 Olga, Katie and Eleanor were selected as the winners for St Johns and were invited to attend the Kent Primary School Final. The final challenge was to design a vehicle that could travel the furthest using the energy from elastic bands. Our girls won! Congratulations Olga, Katie and Eleanor! The facilitators said that they were particularly impressed, that with 10 minutes to go the girls were not afraid to take their vehicle apart and improve it, even though it was a very simple design. The girls were commended on their excellent, supportive team work.